Another good question. 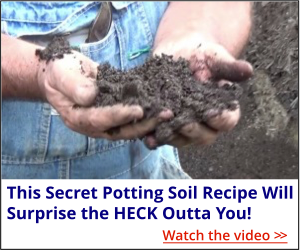 It varies from plant to plant but many things will root in four weeks, some things take six weeks, possibly eight weeks depending on what time of the year you stick the cuttings and I explain all of that in great detail in my Backyard Growing System. 7. In the book that comes with my Backyard Growing System, “Small Plants, Big Profits from Home” I show you many different ways to sell the plants that you grow. 8. Sorry, that book is not available in book stores, Amazon or any other place because it’s part of a package that only I sell. I keep the information in that book very close to my chest which is why only I sell it. 9. Arithmetic. In the area the size of a table place mat you can root 198 cuttings, each cutting sells for 65¢ each, that’s a total of $128.70. My system, “Small Plants, Big Profits from Home” is only $47.00! Okay, those are the facts. You can grow thousands of rooted cuttings at one time and you can sell them for 65¢ each. You can make $128.70 in an area the size of a Table Place Mat and my system only sells for $47.00! Mike’s System, “Small Plants, Big Profits from Home” Comes With . . .
“This book, “Small Plants, Big Profits from Home” is new. I just wrote it in August of 2012, and it is an awesome resource! This book contains all of the secrets that I’ve learned since I started selling this system 14 years ago. The first DVD is all about the Backyard Nursery Business and was filmed in my original Backyard Nursery which was only 1/10th of an acre and I sold tens of thousands of dollars worth of small plants from that Itty Bitty nursery. That nursery inspired my entire online business. The second DVD is very new, filmed in 2012 at my new location. This DVD is called “Plant Propagation Madness” and details exactly how I do my plant propagation today. The system that I use really is secret, I never share that with people who are not customers. I share a great deal of information online, but I never share “Plant Propagation Madness”. That’s why I dedicated an entire DVD to the subject. Real Products You can Hold in Your Hand! The two DVDs and the book are physical products, we ship them to you via Priority Mail. The Advance Email Course is delivered via Email and it is awesome! It contains information that I only share with customers. You also get a digital copy of my book “Easy Plant Propagation” which is an incredible resources about growing and propagating plants. It has a month by month guide of what you should be doing as well as a plant by plant guide. Since this is digital you can be reading it in minutes after you order. You get a digital copy of my “Secret Directory of Wholesale Suppliers”. (that’s where I buy everything I need for my nursery. Rooted cuttings, Japanese Red Maples for about $1.50 each, nursery pots, you name it! My report “The Inside Secrets of the Rooted Cutting Business” contains a wealth of information including how to sell plants online without leaving home and without having people come to your house. That’s a ton of stuff for $47.00! Click here to order. It’s only $47.00! could Be a Life Changing Experience for You.